Watrous Mennonite Brethren Church, ca. 1950-1951. Philidelphia Mennonite Brethren Church, 2010. 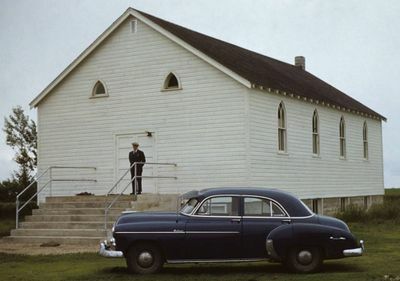 The Philadelphia Mennonite Brethren congregation in Watrous, Saskatchewan, began services and formally organized in 1927. Services were held in an old school building beginning in 1927. In 1929 twenty-one charter members formed the nucleus of the church. The church was received into the Canadian Mennonite Brethren Conference in 1936 under the leadership of Peter Janzen. In 1937 the church had a membership of 135. A church building was completed in 1949, and in 1975 a new church was built. Philadelphia was previously known as Watrous Mennonite Brethren. It was affiliated with Evangelical Mennonite Brethren until 1932. Early members had been part of the Allianz Gemeinden in Russia. Mennonite Brethren Herald (27 May 1988): 67; (24 August 1990): 29. Centre for Mennonite Brethren Studies, Winnipeg, MB: Volume 636; microfilm R6, pp. 323–564; R7, pp. 465–670. Location: 102 - 5th Avenue West, Watrous, SK S0K 4T0; the church building is located on Saskatchewan Highway #668 about 16 km east of Watrous, Saskatchewan (51.7365°N 105.3168°W). The cemetery is on the church yard. Epp, Marlene. "Philadelphia Mennonite Brethren Church (Watrous, Saskatchewan, Canada)." Global Anabaptist Mennonite Encyclopedia Online. August 2012. Web. 19 Apr 2019. http://gameo.org/index.php?title=Philadelphia_Mennonite_Brethren_Church_(Watrous,_Saskatchewan,_Canada)&oldid=163455. Epp, Marlene. (August 2012). 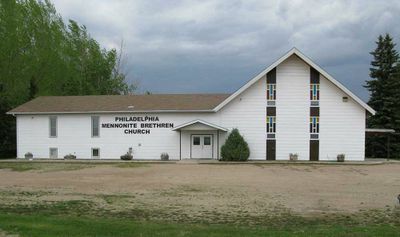 Philadelphia Mennonite Brethren Church (Watrous, Saskatchewan, Canada). Global Anabaptist Mennonite Encyclopedia Online. Retrieved 19 April 2019, from http://gameo.org/index.php?title=Philadelphia_Mennonite_Brethren_Church_(Watrous,_Saskatchewan,_Canada)&oldid=163455.